MATERIAL II: ORGANIC COTTON 25%, ORGANIC LINEN 75%, GARDENIA BERRY DYED. LINING: ORGANIC COTTON 48%, ORGANIC SILK 52%, INK-JET PRINTED. GOTS certified fibers. Natural dye. Vegetable-tanned calfskin. Use of the “DRY PRINTING” technique that saves 90% of water in the printing process. 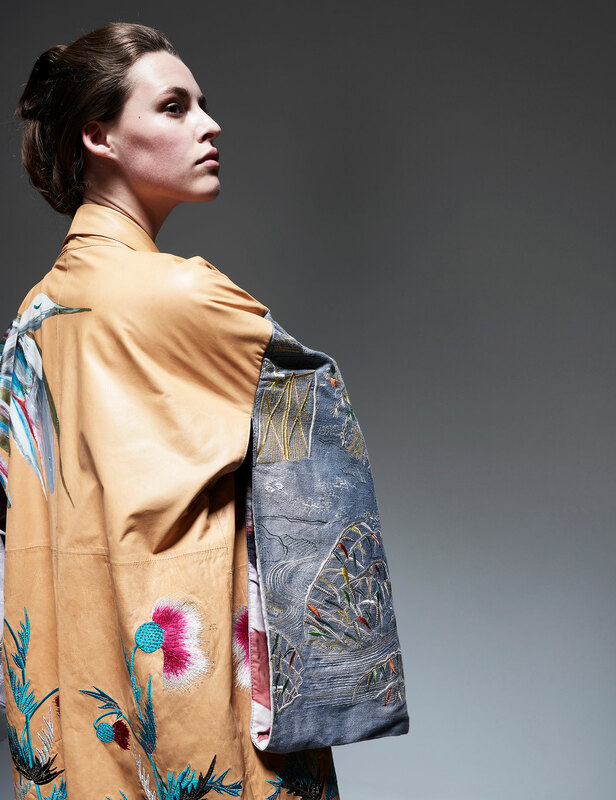 FABRICS: TEB Tessile Eco Bio, NATURAL DYE: Stefano Panconesi at Iride, LEATHER: INCAS, EMBROIDERY: Arte e Ricamo, INK-JET PRINT: Seride using MS Italy “dry printing” machine, LABELS: Dienpi, PATTERN: TM Project, FAÇON: Terzo Balducci, HAND PAINTING: Silvia Giovanardi. 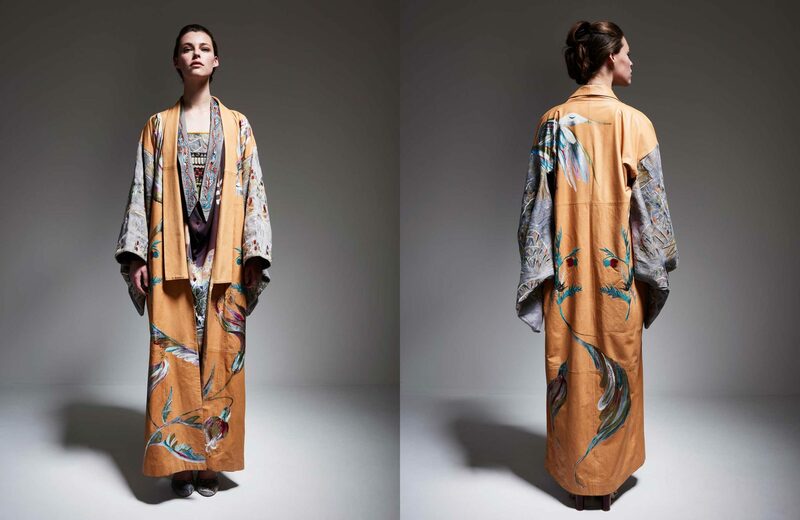 Full length reversible kimono coat with side pockets. 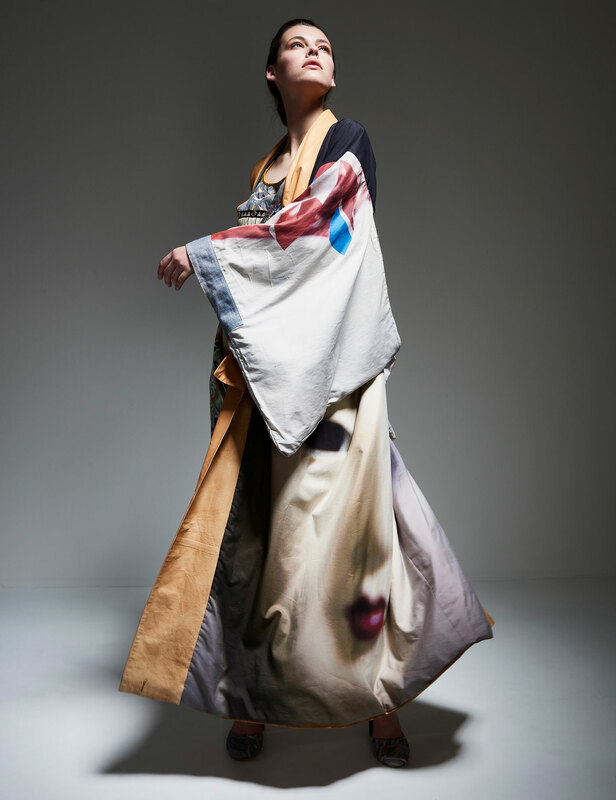 The lining features two printed photographs Silvia Giovanardi took during her honeymoon in Japan: “PURE HUMANITY” for the body and “MALE AND FEMALE SCENT OF NATURE” for the sleeves. 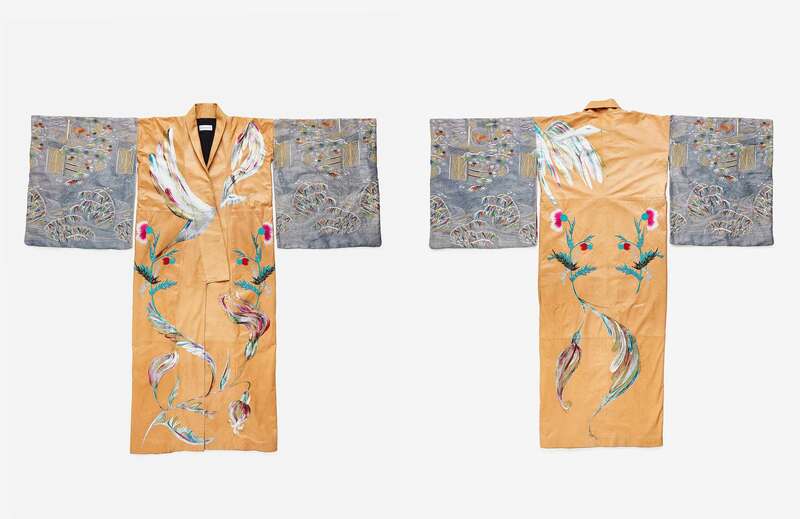 The organic linen and natural dyed sleeves are embroidered with a japanese Edo period ancient graphic, and the vegetable-tanned calfskin body has embroidered carnations and hand painted peace cranes on it.